Insider threats are perhaps the most serious challenges that nuclear security systems face. All of the cases of theft of nuclear materials where the circumstances of the theft are known were perpetrated either by insiders or with the help of insiders; given that the other cases involve bulk material stolen covertly without anyone being aware the material was missing, there is every reason to believe that they were perpetrated by insiders as well. Similarly, disgruntled workers from inside nuclear facilities have perpetrated many of the known incidents of nuclear sabotage. The most recent example of which we are aware is the apparent insider sabotage of a diesel generator at the San Onofre nuclear plant in the United States in 2012; the most spectacular was an incident three decades ago in which an insider placed explosives directly on the steel pressure vessel head of a nuclear reactor and then detonated them. While many such incidents, including the two just mentioned, appear to have been intended to send a message to management, not to spread radioactivity, they highlight the immense dangers that could arise from insiders with more malevolent intent. As it turns out, insiders perpetrate a large fraction of thefts from heavily guarded non-nuclear facilities as well. Yet organizations often find it difficult to understandand protect against insider threats. Why is this the case? Part of the answer is that there are deep organizational and cognitive biases that lead managers to downplay the threats insiders pose to their nuclear facilities and operations. 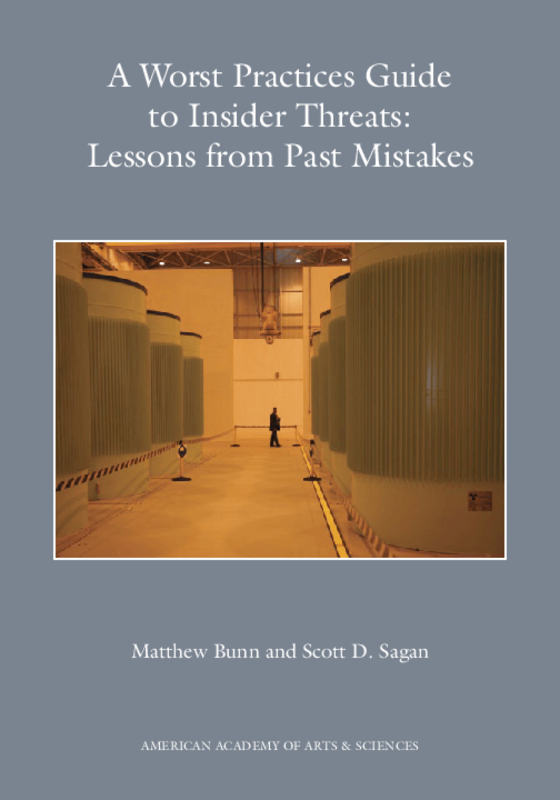 But another part of the answer is that those managing nuclear security often have limited information about incidents that have happened in other countries or in other industries, and the lessons that might be learned from them. The IAEA and the World Institute for Nuclear Security (WINS) produce"best practices" guides as a way of disseminating ideas and procedures that have been identified as leading to improved security. Both have produced guides on protecting against insider threats.5 But sometimes mistakes are even moreinstructive than successes. Here, we are presenting a kind of "worst practices" guide of serious mistakes made in the past regarding insider threats. While each situation is unique, and serious insider problems are relatively rare, the incidents we describe reflect issues that exist in many contexts and that every nuclear security manager should consider. Common organizational practices -- such as prioritizing production over security, failure to share information across subunits, inadequate rules or inappropriate waiving of rules, exaggerated faith in group loyalty, and excessive focus on external threats -- can be seen in many past failures to protect against insider threats. Copyright 2014 American Academy of Arts and Sciences.